Prism Tower as it appears in Smash. Prism Tower (プリズムタワー, Prism Tower) is a stage in Super Smash Bros. for Nintendo 3DS and Super Smash Bros. Ultimate. It originates from the Pokémon universe and is set in Lumiose City of the Kalos region. The stage begins on the streets in front of the tower's base in broad daylight. A few seconds into the battle, moving platforms will appear and must be jumped onto to begin the ascent to the top. Near the top, the sun begins to set, and it turns nighttime once at the top, where the players can continue to fight. Eventually, the platform flies away from the tower, then down back to the front of the tower's base as daylight returns. The stage always plays out in a set order for the same amount of time. Like Saffron City, Pokémon Stadium 2, and Spear Pillar, there are Pokémon that appear in the background. Helioptile can be seen on the ground, while Magnemite, Zapdos, Emolga, and Yveltal can be seen while the platform flies around the tower. In Super Smash Bros. for Nintendo 3DS, the Ω form is set on a metallic platform far above the ground, with the city seen in the background. In Super Smash Bros. Ultimate, the Ω form and Battlefield form are similar to SSB4's Ω form; however, the main platform is redesigned, and it is resized and reshaped to match Final Destination and Battlefield, respectively. The three soft platforms of the Battlefield form resemble the ones in the normal form. Unlike in SSB4, where the stage stayed in nighttime, Ultimate's variants feature a day-night cycle. In Pokémon X and Y, Lumiose City is at the center of the Kalos region and is the largest city in the Pokémon world. 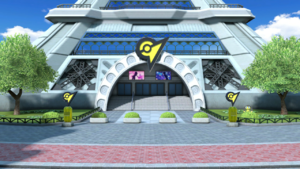 The Prism Tower, in Centrico Plaza, is actually the Lumiose Gym, where the player battles Clemont—an Electric-type specialist—for the Voltage Badge after solving a series of questions involving Pokémon. The design of the Prism Tower is based on the Eiffel Tower (Lumiose City itself is based on Paris). The Prism Tower trophy is exclusive to Super Smash Bros. for Nintendo 3DS. A notable location from Pokémon X and Pokémon Y. The Prism Tower is the symbol of Lumiose City, the metropolis at the heart of the Kalos region. In this game, platforms will take you on a tour around the tower and its surrounding areas, and at night you can marvel at the fabulous illuminations. You may see different Pokémon, as well. A notable location from Pokémon X and Pokémon Y. The Prism Tower is the symbol of Lumiose City, the metropolis at the heart of the Kalos region. In this game, platforms will take you on a tour around the tower and its surrounding areas, and at night you can marvel at the fabulous illuminations. Of course, you may run into a Pokémon, too. The platform begins to rise. Near the middle of the tower. Rising to the top of the tower. Near the top of the tower. The platform leaves Prism Tower. At night, far away from the tower. The furthest stop from the tower. As the platform returns to the tower's base, the time of day turns to morning. Mewtwo taunting in front of the tower. Prism Tower as it originally appeared in Pokémon X and Y.
Sonic running with Falco on the stage. Ike charging Eruption on the stage. A pink and blue King K. Rool on the stage. Lucario performing its neutral aerial in front of Samus on the stage. Palutena in her cyan alternate costume on the stage. Charizard using Flare Blitz on the stage. The female trainer throwing a Poké Ball on the stage. Zelda giving Rosalina a high-five on the stage. Link using his Bow and Arrows on the stage. Yuri with the Camera Obscura on the stage. This page was last edited on April 17, 2019, at 02:23.